You are here: Home / Chapter 7 Bankruptcy / When Your Chapter 13 Plan Payment Is Not Written In Stone? When Your Chapter 13 Plan Payment Is Not Written In Stone? In most chapter 13 bankruptcy cases, upon confirmation, a monthly payment is set in place and it will not vary. However, there is always an exception to this rule. In some circumstances, the debtor can bring a motion to modify the plan such as a case where there is a significant decrease in income. Well what is good for the goose is good for the gander. Thus, the Chapter 13 trustee has the ability to bring a motion to increase the plan payment should there be a significant increase in income. This is provided for under section 1329 of the United States Bankruptcy Code which is entitled “modification of plan after confirmation.” One of my recent debtors just incurred this event. In our fact scenario, the debtor was paying $300 per month for 36 months which provided for a 10% repayment to unsecured creditors. The debtor was nine months away from completing the plan when the trustee brought a motion to modify plan. The trustee was able to gather from the debtor’s tax returns that the income increased significantly, in fact, it more than doubled. 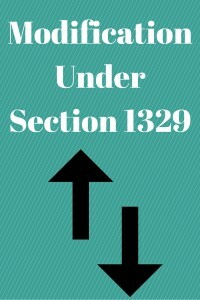 Based upon this fact, the trustee brought its motion pursuant to section 1329 which states in part: at any time after confirmation of the plan, before the completion of payments under such plan, the plan may be modified, upon request of the debtor, the trustee, or the holder of an allowed unsecured claim to – increase or reduce the amount of payments on claims of a particular class provided for by the plan. What this means to the debtor is extremely drastic. The debtor believed that he was paying back $2700 worth of debt to unsecured creditors instead of $27,000 worth of debt. Since there was a significant increase in income, the trustee is likely to be successful in its motion to modify the plan. If this modification were to occur, the debtor would be paying back 100% of his unsecured debt or the full $27,000. To add insult to injury, this motion is being brought nine months before the suspected completion of the case. Further, $5600 of the unsecured debt is City of Chicago parking tickets. Should the debtor not pay 100% of the debt and have the case dismissed, the debtor will be subject to the city of Chicago’s wrath which could include booting the vehicle, impounding the vehicle and suspending the debtor’s driver’s license in the State of Illinois. Thus, we have a very drastic situation to deal with. What we are going to do is analyze the income and expenses of the debtor. We’re going to see whether or not the additional income disclosed on the tax return is still in play. Where going to see if there are any additional expenses in the debtor’s schedules. We’re also going to try and bring a defense of collateral estoppel or latches in that the trustee waited until very close to the end of the plan to spring this motion. Cases on the trustee’s side include Petrol versus Mishler as well as In Re Witkowski which both talk about the trustee’s ability to monitor the income via tax returns and the ability to modify the plan pursuant to section 1329. Please note that the above example is not the typical case. Most debtors in a chapter 13 bankruptcy case do not see more than double an increase in income while they are in the plan. In fact 99% of most debtors struggle to continue to make their existing chapter 13 plan as well as all of their other living expenses. It is only in the rarest case where we see a significant increase in income and even rarer, a chapter 13 trustee’s motion to modify plan. I simply want to make the readers aware that this situation does exist and it can happen in certain circumstances, albeit rarely.